I found J.D. 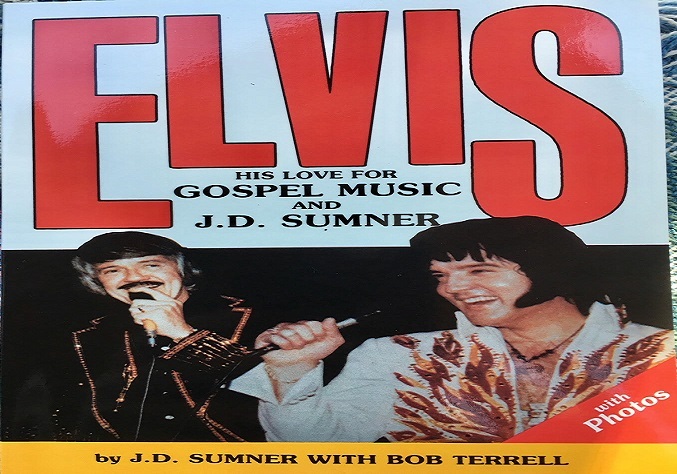 Sumner’s autographed Elvis book during Elvis Week, the 40th Anniversary. I was SO excited to read it, but somehow it got lost on my shelves with all the others. Four months later, I finally read this short little book of just over 100 pages. J.D. has always held a special place in my heart because I knew he truly loved Elvis and Elvis truly loved him. Also during Elvis Week, the 30th Anniversary 10 years ago, I bought a piece from J.D.’s collection from his family – a wooden 1978 Elvis calendar. J.D. Sumner was a Gospel Singer, a bass Gospel singer. I read his book on a Sunday morning while listening to Elvis Gospel. In 1971, Elvis hired J.D. Sumner and The Stamps to tour with him. Elvis and J.D. had been friends since J.D. used to sneak a young Elvis into the Blackwood Brothers shows through the backdoor of the Ellis Auditorium in Memphis in the early 1950s. Elvis invited J.D. and The Stamps back to his suite after every show to sing with him. Elvis gave J.D. his TCB ring then had another made for himself with black onyx behind the diamond. (I have a replica of this ring.) An acetate of The Stamps J.D. gave Elvis is still on Elvis’ record player in his room today. J.D. said he wrote this book (in 1991) to set the record straight. J.D. confirmed that neither Dee or any of the Stanley boys were that close to Elvis – that he just tolerated them. J.D. writes David lied about J.D. in his book. J.D. writes Elvis truly loved Priscilla and in the end was not going to marry Ginger (although he originally said he was) because he wanted Priscilla back. J.D. also writes Lamar and Sonny (as well as David) actually bugged Elvis, which is why they were paid to work away from him. (I have never heard this before and was quite shocked.) J.D. and Elvis truly loved each other, which was evident when Vernon asked J.D. to plan Elvis’ funeral because he knew what songs Elvis would like.